A new series of rare TV Classics from Nostalgia Merchant. Volume One includes sixteen extremely rare episodes that haven’t been seen on television for over fifty years. Excellent Quality video and audio. New Release – 16 rare TV shows from the 1950s in a 4 DVD Set. Some of these classics haven’t been seen on television in many years. 16 mm film transfers. Digitally remastered. 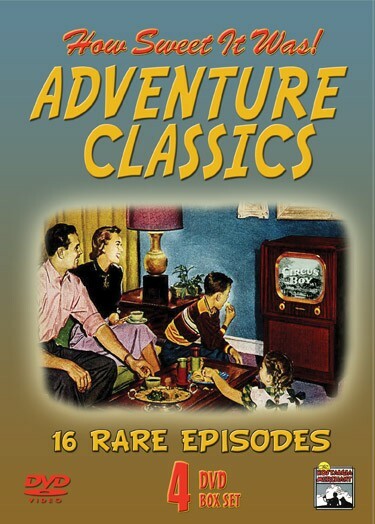 Adventures in Paradise, Bold Venture, Captain Midnight, Cross Current, Captain Grief – 3 episodes – (Ghost of Tupapau, Idols of Raoa-Nui), Octopus, Overseas Adventure, Adventures of Sir Lancelot, Adventures of the Scarlet Pimpernel, Adventures of Fu Manchu – 2 episodes – (Prisoner and Death Ships), Circus Boy, Rescue 8 – 2 episodes – (Bells of Fear and Find That Bomb), Big Town. Adventure Classics is a 4 DVD set.